Single Drum Vibrating Roller, China Single Drum Roller Manufacturer and Supplier. R220C、R218C、R216C、R214C、R212C、R210C heavy duty single drum vibrating roller effect powerful centrifugal force and great static linear load, They are suitable for non-cohesive materials, such as sandy soil, gravel, crushed stones, rock fillings and slightly cohesive soil, gravel, crushed stones, rock fillings and slightly cohesive soils, designed for large foundation constructions such as high-class highways, mines, airports, harbors, railways and industrial areas etc. 1. Mechanical travel drive double amplitude, hydraulic vibration and steering with optimal function/price ratio and reliable performance. 2. Reliable D6114 or YC6108 diesel engine for convenient operation and maintenance. 3. Two sets of brake devices, a hand brake and foot pedal brake, assure the single drum vibrating roller safety and dependability. 4. Spacious and comfortable cab mounted on top quality rubber damping elements. 5. World advanced technology is adopted for the hydraulic vibration technology, high in reliability, simple and convenient in maintenance, and low in cost. 6. Equipped with padfoot or removal padfoot as option. We produced single drum vibrating roller has been exported to Europe, South America, Middle East, Southeast Asia and Africa, and it is very popular there. 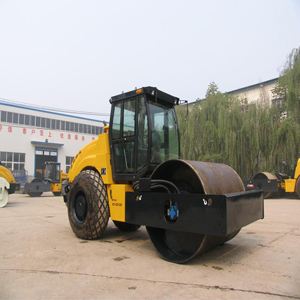 World Equipment is a leading Chinese manufacturer and supplier of road roller in our over 10 years export experience. We offer six types of single drum vibrating roller, namely, R210 (10 Ton), R212C (12 Ton), R214C (14 Ton), R216C (16 Ton), R218C (18 Ton), R220C (20 Ton). If you need single drum vibrating roller, please contact us.